To understand what she was like then, you have to imagine yourself in a place in which columns affect you; where you can retrace stairs where arches full of danger bridge the chasm of a space that remained within you, because it had been made, towering, of such pieces that you can no longer remove them from yourself lest you demolished yourself. If you have reached that state, if everything within you is stone, wall, ramp, view, curve, then try to remove the big curtain in front of you with both hands: it sparkles of very noble things and surpasses your breath and touch. Up, down, palace built upon palace, Railings stream wider from within railings, and surface above surface on such edges that vertigo, as you can see, grasps you. Clouds of incense diffuse what is close, but still the most distant aims right inside of you with its straight rays - and now, when the glow from clear bowls of flame plays on slowly approaching robes: how can you bear it? She, however, came and raised her eyes to view all this. (A child, a little girl among women) Then she ascended silently, filled with confidence, towards the spoiled luxury which made way for her: For that is how much everything that men built had already been exceeded by the praise within her heart; by the desire to give herself to the signs within her: The parents wanted to lift her up, the looming figure with the bejeweled chest seemed to receive her: But she passed through everyone, small as she ways, slipped from every hand into her destiny, which, higher than the hall, was ready, and heavier than the temple. Today, November 21, we celebrate the feast of the Presentation of the Blessed Virgin Mary—the moment in which her parents,Saints Anna and Joaquim, committed Our Blessed Mother to the Lord. From that day on, when she was approximately three years old, Mary lived in the temple, working, praying, and contemplating the awesome love of God, and every day growing closer to Him. As Mary emptied herself of her worldly ties, she was filled with the grace of God, and was prepared for her unique and perfect role in the salvation of mankind through the birth of her Son. The feast of the Presentation of the Blessed Virgin is the third feast in the Marian cycle of feast days that correspond to three events in the life of her Son, Our Lord, Jesus Christ. These three feasts are the Nativity of Our Lady(September 8), the feast of the Most Holy Name of Mary (September 12), and today’s feast, the Presentation of the Blessed Virgin at the Temple. These three feasts correspond to the first three feasts in the cycle of feasts of our Lord: the Nativity of Our Lord (December 25), the feast of the Most Holy Name of Jesus (January 3), and His Presentation in the Temple (February 2). In this way, we see that the life of Our Blessed Mother, from the very beginning, was pre-destined to mirror that of Her Son. Her example both foretells and echoes the journey of Christ on earth, as only a mother could do. It further reminds us that the holiness conferred on Mary from the very beginning of her existence—the Immaculate Conception—continued throughout her early childhood into her life as a young woman. The Birth of Mary the Holy Mother of God, and Very Glorious Mother of Jesus Christ. 7. And her months were added to the child. And the child was two years old, and Joachim said: Let us take her up to the temple of the Lord, that we may pay the vow that we have vowed, lest perchance the Lord send to us, and our offering be not received. And Anna said: Let us wait for the third year, in order that the child may not seek for father or mother. And Joachim said: So let us wait. And the child was three years old, and Joachim said: Invite the daughters of the Hebrews that are undefiled, and let them take each a lamp, and let them stand with the lamps burning, that the child may not turn back, and her heart be captivated from the temple of the Lord. And they did so until they went up into the temple of the Lord. And the priest received her, and kissed her, and blessed her, saying: The Lord has magnified your name in all generations. In you, on the last of the days, the Lord will manifest His redemption to the sons of Israel. And he set her down upon the third step of the altar, and the Lord God sent grace upon her; and she danced with her feet, and all the house of Israel loved her. 8. And her parents went down marveling, and praising the Lord God, because the child had not turned back. And Mary was in the temple of the Lord as if she were a dove that dwelt there, and she received food from the hand of an angel. And so we see that Our Lady was chosen by the Lord, long before the Annunciationof the Archangel Gabriel to her. In the divine plan, Our Blessed Mother was conceived, untouched by sin, and then remained in that manner, having been given to the Lord by her parents. In the temple, where she remained until Gabriel appeared to her, she filled herself with love for the Lord, becoming both mother to, and disciple of, her blessed Son, Our Lord. We don’t know exactly how these twelve years of preparation went for Mary. Saint Jerome, in his writings, however, provides us a glimpse of what her days may have been like. Our Blessed Mother, along with the other virgins committed to the temple, would arise at dawn and pray until nine o’clock. From 9:00 until 3:00, she would engage in manual work, most likely weaving. At 3:00, she would return to prayer. As Saint Jerome recorded, Our Blessed Mother was “always the first to undertake night watches, the One most applied to study, the most fervent in the chanting of Psalms, the most zealous in works of charity, the purest among the virgins, Her companions, the most perfect in the practice of every virtue. 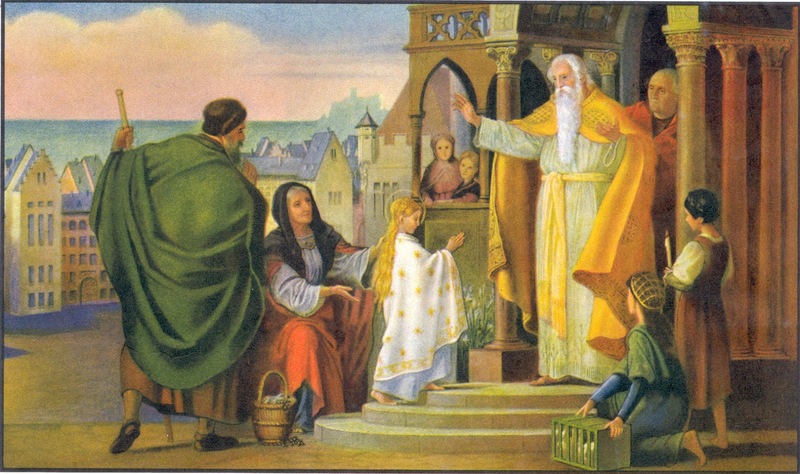 On this day She appears as the standard-bearer for Christian virginity: after Her will come countless legions of virgins consecrated to the Lord, both in the shadow of the altars or engaged in the charitable occupations of the Church in the world.” She took only one meal per day, giving her remaining food to the poor. Angels were recorded as visiting her regularly. She was described as beautiful and cheerful, never angry, and full of grace in her conversations. Mostly, Our Blessed Mother spent her time praying before the Holy of Holies. In the end, we don’t have many specifics, with the exception of those written by James. However, what we do know makes a very clear point: Mary, even from her earliest childhood, belonged utterly and completely to the Lord. Even before she could consciously realize, her soul and body were devoted to His plan and longed to serve Him. Her role in the Nativity of Christ, the Incarnation at the Annunciation, her sorrow in His suffering and death were begun at her Immaculate Conception, but made clear on earth at her Presentation. Our Blessed Mother was redeemed in the temple through her faith and the working of the grace of the Lord, and today, we look to her as a model of Christian humanity, joined to her Son, longing for Him, as we should.